Each Cushion is approximately 18"- 20" by 18"- 20" and 3" thick. 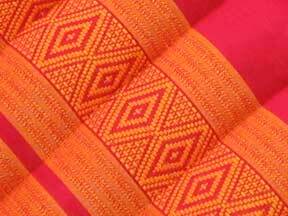 The cover is a traditional Thai Pattern in Cotton. Cushions are stuffed with cotton/kapok and are very firm. In the Thai home they provide additional setting.